Brand new 2014 GIBSON LES PAUL STUDIO PRO - FIREBURST CANDY. 100% mint, unplayed, not been a demo in a retail store. Genuine made in USA. The new 2014 models have the 120th Anniversary plaque on the 12th fret. The STUDIO PRO has become much more than a price entry level axe. The tone on these 57 humbuckers and burstbucker pups is to die for. This guitar is great value for the features you are getting. I really rate this instrument. 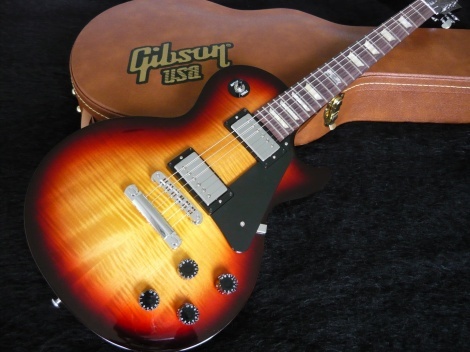 The Gibson 2014 Les Paul Studio Pro Electric Guitar celebrates Gibson's 120th Anniversary in style. It has a mahogany body with modern weight relief and a maple top. The mahogany neck has a '60s slim taper. The bound rosewood fingerboard has a compound radius, trapezoid inlays and sports a 120th Anniversary banner at the 12th fret. Other key features include 57 Classic and BurstBucker pro pickups, push/pull coil split with orange drop capacitors, max grip speed knobs, vintage-style tuners, Graph Tech nut and chrome tune-o-matic bridge. Includes Gibson Vintage brown retro hard case.